There is a saying that the difference between the English and the Americans is that to an American, a hundred years is a long time ago, and to an Englishman, a hundred miles is a great distance. Apt - and in a fair way to be true. All across the Southwest, our very oldest existing buildings, aside from various Indian pueblos, are the missions; at best a couple of centuries and change, pale and makeshift reflections of the great cathedrals of Spain. A drive of a hundred miles is nothing special at all. 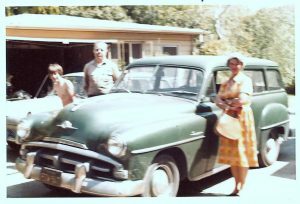 Growing up we spent a lot of time in the family car, my brother JP and sister Pippy and I, in the commodious back seat of "Old Betsy" - a jade-green 1952 Plymouth Station wagon, which my Dad bought slightly used and which my mother drove for thirty years. Dad eventually bought, and dismembered another ‘52 Plymouth to keep the first in parts: door panels, windows and engine parts and all, although the split windshield was inadvertently wrecked by our horse, blundering into the garage in search of his specialty horse-food, and stepping flat onto the glass panes. Old Betsy got a new coat of paint every couple of years, and our best-remembered road trips was when Dad took us to Mexico, to get a new headliner installed at a cut-rate body and interior-work shop. While Betsy was being worked on, we watched a glass-blower demonstration, and looked at painted pottery and coarse hairy serapes and other touristy junk. We so wanted to go to a bullfight, the arena had the most interesting posters outside! In a bakery-grocery, Dad bought us fresh rolls, fruit, and bottled soft-drinks, nothing that would tax our delicate, first-world digestive systems. Our great adventure, the first time we had ever been to a foreign country. JP and Pippy and I could look around and think, "Not American." But not entirely foreign, not as long as we were looking at it from the back seat of Old Betsy. How many weeks and months of my life were spent in the back seat of that car? Going to my grandparents' houses, to church, countless trips to school when the weather was bad, out to the desert or into the mountains with Dad for camping trips, to summer-camp in the mountains, to swimming lessons; how many weeks and months would that work out to be; JP and I on either side and Pippy in the middle, being the littlest, and least inconvenienced by the hump of the transmission in the middle of the floor? Looking out the window, daydreaming as the cityscape and the countryside swept by, seeing the hills upholstered in crunchy golden grass and spotted by dark green live oaks, watching for landmarks as the grey highway unspooled in front of us, the landmarks that let us know how close we were to wherever? I was apt to get car-sick; the preventive was to have a window open and the fresh air blowing in, and to sing. We had a wide repertoire of folk songs, of hymns, of campfire songs, all sung in tight family harmony, and we would talk. So many things we talked about- the back of the Plymouth is where we first heard that we were going to have a baby brother, where Great-Aunt Nan talked about her half-brother, so many family moments. The back of the car, on the way to so many places - that's where family is, the place that memories are made.